The loveliest of pale pink autumn blooms beautifully arranged in a white ceramic pot, featuring perfumed pink lilies and the prettiest seasonal stems available on the day, such as celosia, snapdragons, lisianthus and berries. 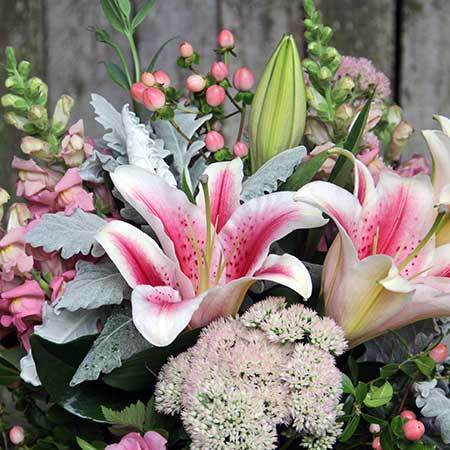 Accented with fresh green and silvery foliage, this delicate pink flower arrangement is perfect for saying thank you, happy birthday, congratulations and more. Order these flowers online or give the team a call toll free on 1800 66 66 46. *Please note: The pictured flower arrangement is exclusive to Sydney flower delivery only. 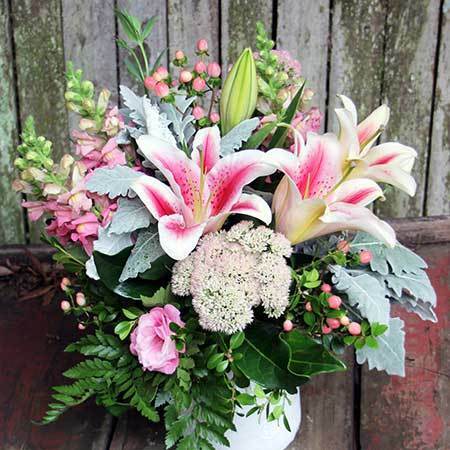 For flowers delivered elsewhere in Australia, the team will coordinate your order via an affiliate florist network to recreate our style and presentation as closely as possible. 2016-09-02 Service rating : Service on the phone was good. They were helpful and patient when making a decision on what flowers to get. Product : I was a little disappointed in the look of the flowers and they state they were in. They didn`t look fresh at all compared to other flowers my wife also got on the same day. They already looked limp and like they had already been in the shop for about 3 or 4 days. For the money I spent I wasn`t happy. Product : Lovely arrangement. Recipient very happy! 2015-08-11 Flowers were fresh and great quality. Design was closely matched to photo from the website. 2015-07-02 Very convenient to be able to order last minute for delivery next / same day. Prices seem very reasonable as well. 2015-03-26 Service rating : Excellent service super fast delivery.